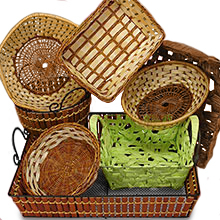 I sell all things wicker – log baskets, garden trugs, tool baskets complete with tools, shopping baskets, condiment holders, napkin holders, all size wine carriers. Picnic hampers in all shapes and sizes complete with crockery etc. Chilled wine carriers with shoulder strap. Storage baskets. Wicker garden planters. Anything wicker I sell it!